Spiders are polarizing: people tend to be fascinated or fearful, and for some, Arachnophobia can be quite serious. However, spiders are often feared unnecessarily. They are quickly blamed for almost ALL unexplained bites or lesions! 1. The hobo spider is not aggressive. Here I am, holding an “aggressive” hobo spider. Photo S. McCann. Exhibit A (photo, right): the allegedly aggressive hobo spider. This female hobo was minding her own business on her webuntil being rudely removed to a human hand and made to pose for photographs. 2. The evidence that hobo spiders cause dermonecrotic lesions is poor and largely circumstantial. Hobo spiders are European, but they were introduced to North America in the early 20th century and have since become established in the northwestern US and British Columbia, Canada. Hobo spiders live peacefully alongside humans in Europe, where nobody seems to be all that concerned about them. A 2001 study found no support for the hypothesis that the venom of North American hobo spiders differed from that of their European counterparts in its ability to cause necrosis. Most of the evidence tying hobo spiders to dermonecrotic lesions in medical case studies is weak and circumstantial. For example, the mere presence of this species in the house or even the neighbourhood where the supposed bite victim lived has been used to implicate hobo spiders. There only seems to be one case reported in the medical literature with reasonably incriminating evidence – the dead spider was found crushed under a pant cuff. But even in this case, the person had a pre-existing medical condition and did not seek medical attention for more than 2 months after the bite, casting doubt on whether the spider’s venom was actually responsible for necrosis. 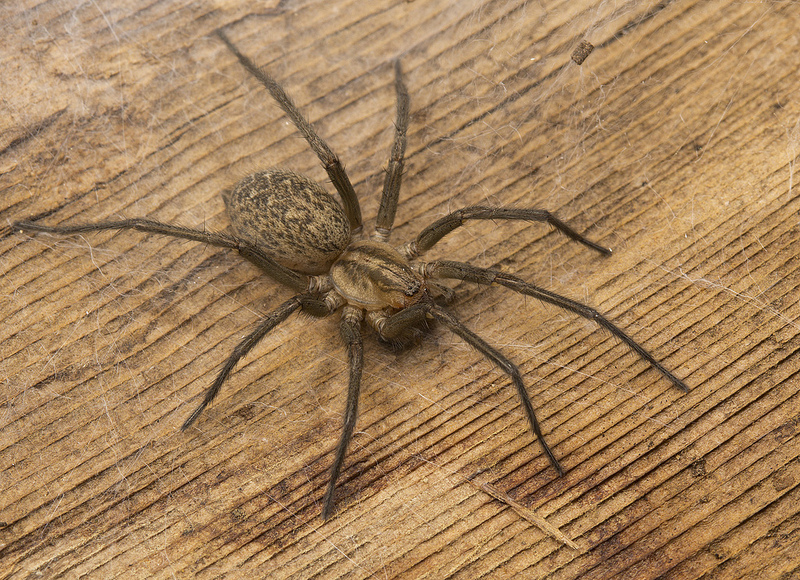 A female hobo spider. Photo by S. McCann. 3. Spider bites are extremely rare, and often misdiagnosed. In spite of there being no brown recluses in Canada, it is common to hear about people who have been diagnosed with brown recluse bites here. Most of these folks never saw a spider or felt a bite, but had their mysterious lesion diagnosed as a spider bite by their doctor, who they trust as an expert. This comic nicely sums up why the vast majority of the time, it is safe to assume that a spider did not bite you. The poor brown recluse is always getting blamed for unexplained lesions. Photo by M. Bertone, reproduced here with permission. Even where there are brown recluse spiders, they hardly ever bite people. There was a family home in Kansas that had 2,055 brown recluse spiders collected from it over a 6-month period, and no one living in the house got bitten. Still not convinced? In Florida, medical professionals diagnosed 124 brown recluse bites over 6 years. That’s 124 people who accidentally got near enough to the alleged spiders to be bitten, while going about their everyday business (only one of them ever produced an actual brown recluse for identification). 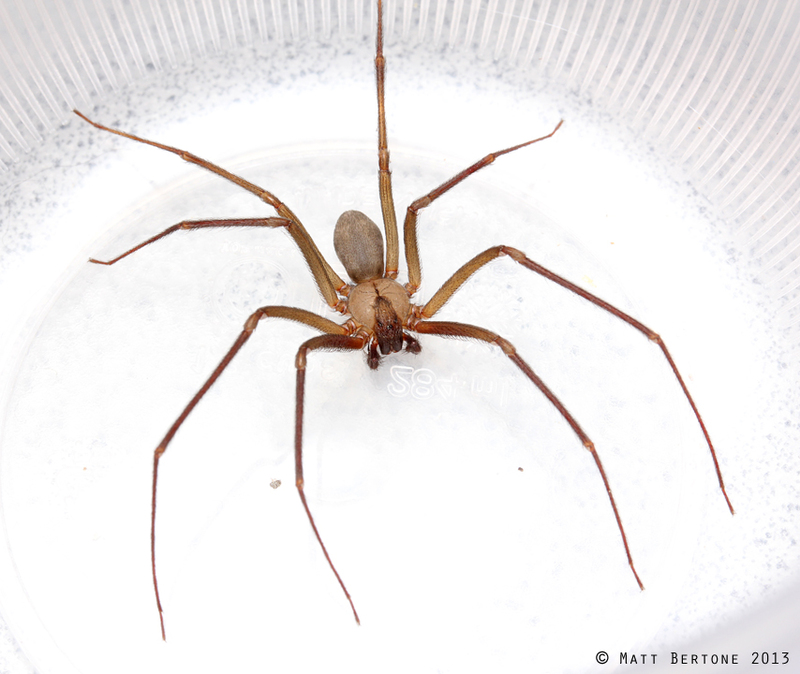 Arachnologists – we’re talking people who actively go around seeking outspiders in likely spots – found only 5 brown recluses in Florida over the same 6-year period and a total of only 70 brown recluse spiders over 100 years. The numbers simply do not add up. Did we mention that spiders hardly ever bite people? Sometimes spiders do bite people, and a few species are legitimately considered medically significant. 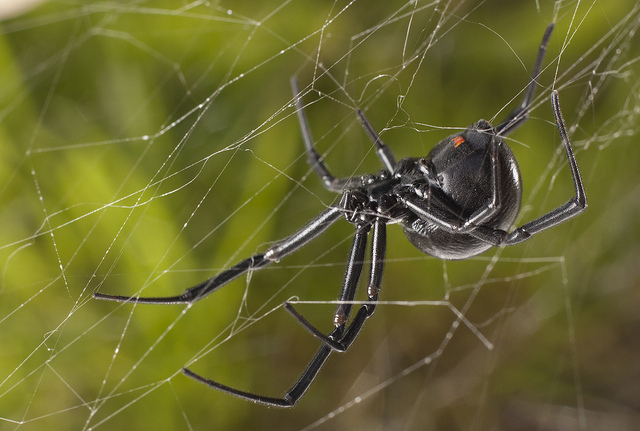 In North America, black widows as well as brown recluse bites are serious and certainly may require medical attention. However, black widows in particular have an undeserved bad reputation. They are not aggressive, rarely bite, and even when they do, they often don’t inject any venom. Most news articles about black widows refer to them at least once as deadly – often in the headline. According to the American Association of Poison Control Centers, 2,246 black widow bites occurred in all of the United Stated in 2012 (that doesn’t mean they were verified as actual black widow bites, just that they got reported, so this is almost certainly an overestimate). Only 21 of these reported bites resulted in major, but non-lifethreatening, symptoms, and no one died. Compare those zero deaths with the 36,166 traffic fatalities in the US in 2012. Cars are not regularly described as deadly but perhaps they should be. It would be more reasonable to fear automobiles than black widows. Arachnophobia is of course a legitimate condition, but there really are a lot of worse things to worry about. A black widow, photographed by S. McCann. Assuming every unknown lesion is a spider bite can prevent accurate diagnosis, and delay proper treatment. Inappropriate treatment based on the misdiagnosis may be ineffective or worse, harmful. Overzealous diagnoses of spider bites can also lead to arachnophobia and reckless, unwarranted attempts to rid homes of spiders. Unnecessary exposure to pesticides is probably much riskier than sharing your home with spiders. In sum, we hope this post is seen as a “Public Service Announcement” (or better yet, a “Public Spider Announcement”) and that we can help dispel some myths about spiders. 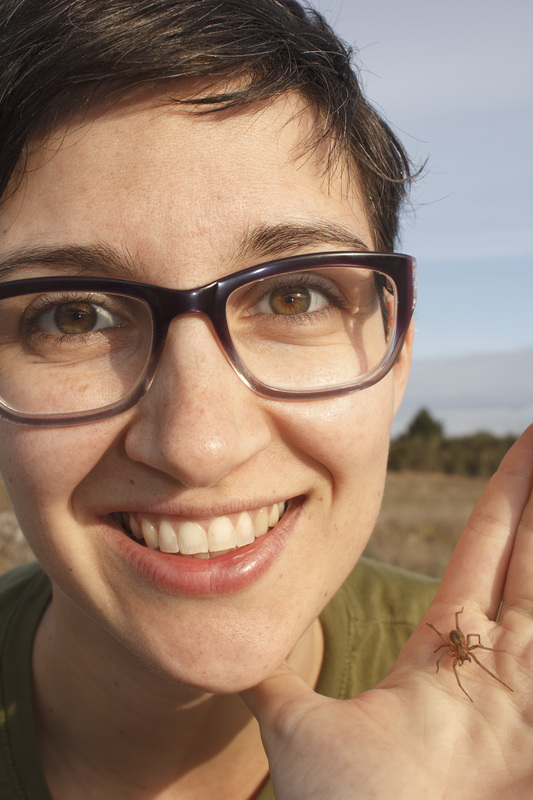 We should be celebrating their incredible biology and natural history, and we should look to spiders as our allies in controlling pest insects, or taking down mosquitoes. We should look at spiders in awe, rather than in fear.